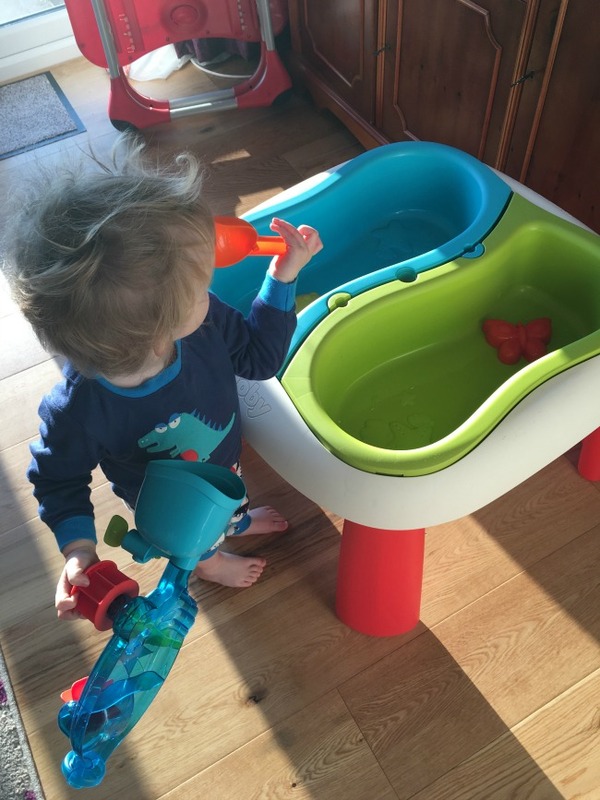 Bear just loves playing with water and quite often "washes his hands" at the kitchen sink and we both get a bit wet. 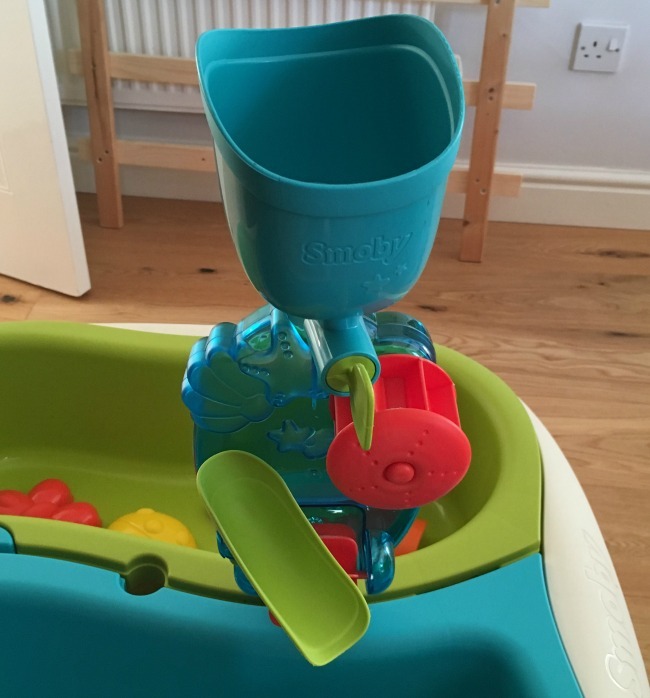 I had some Amazon vouchers* saved and had been thinking of using them to buy him something for the garden that would hold water and sand and then he could make a complete mess without worrying. 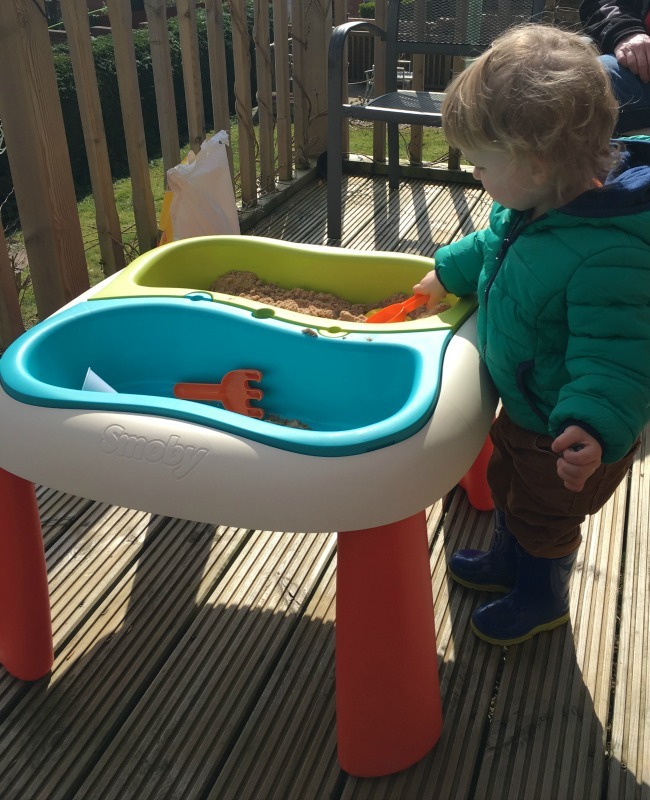 There are a lot of tables available that are much cheaper than the Smoby Water and Sand Table (£47.99) but this got the best reviews. It was really well packaged, in fact it was in a really tough cardboard box that wasn't so easy to open but made a great trampoline for Bear (I've posted a fun video on our Facebook page). To assemble the table all that is needed is to push the legs into the table top. Two minutes all done. It came with a couple of accessories. A rake; a trowel; two moulds and a water wheel. For the money I paid I thought these were a bit cheap looking. The water wheel needed assembling and the parts had to be snapped apart first. This left a few rough edges that I then had to file smooth. As soon as Bear saw it he was fascinated by all the parts. He liked to spin the water wheel. He loved the "spoon" and "fork". It was too cold to go outside first thing this morning so I filled one of the trays with rice. He played happily for ages with the rice. Using the scoop to move it from one tray to the other. 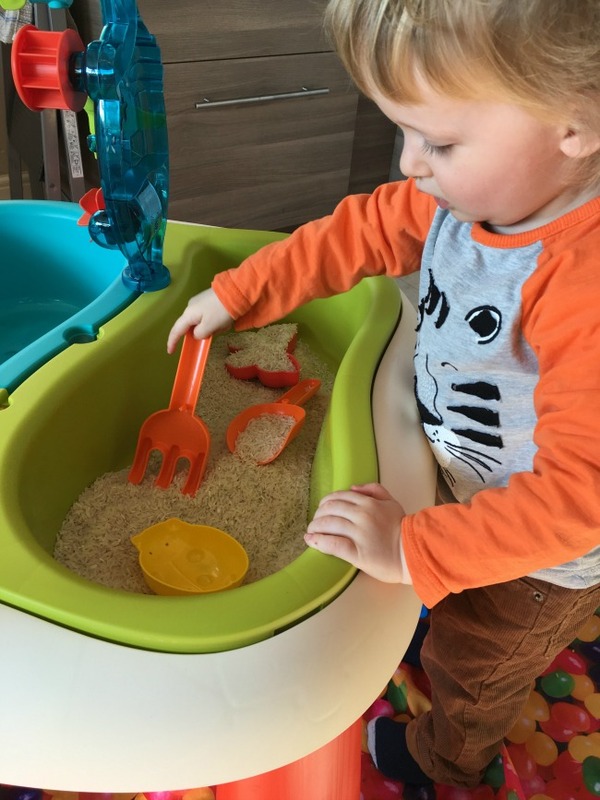 He also found that it was great fun to pour the rice through the hole in the middle (designed for a sun umbrella to go through but not included with the table). It doesn't have to be water or sand. Bear loved playing with raw rice. 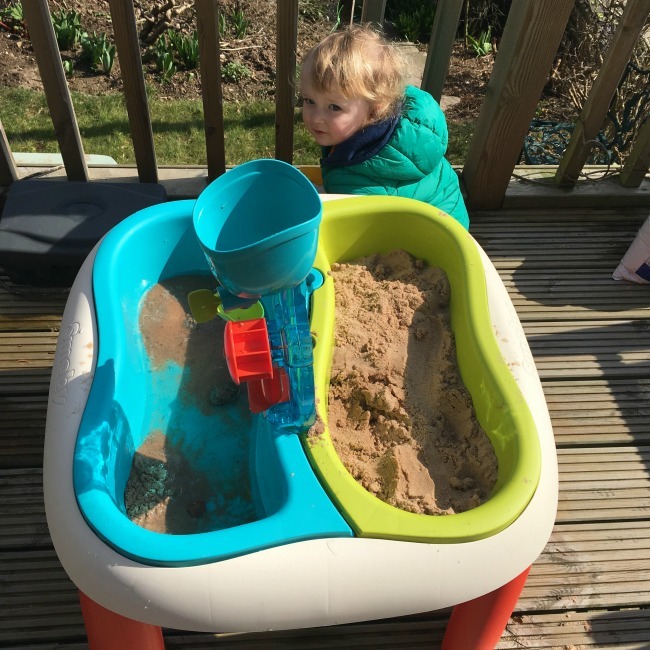 We were lucky to have a warm spring day so took the table outside and filled one tray with sand and put a little water in the other tray. 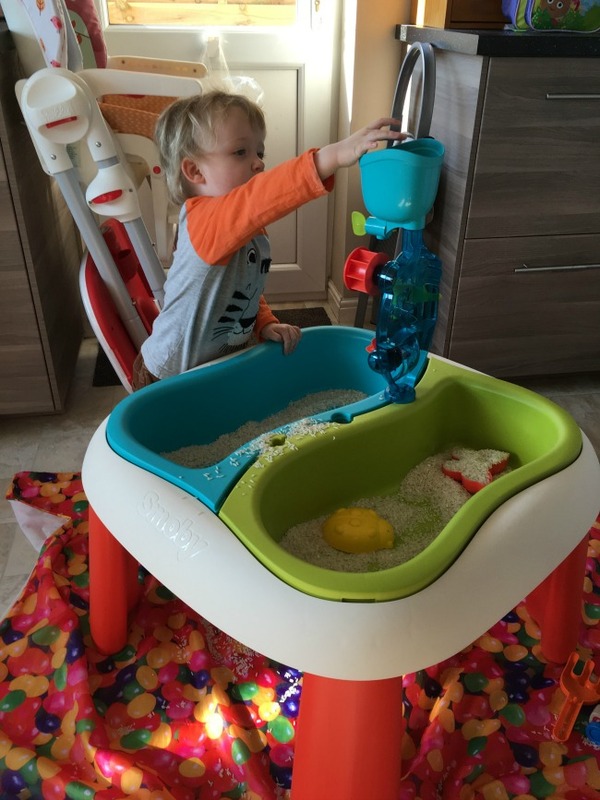 It is suitable for children 18+ months and is just perfect for Bear who is 17¾ months old. 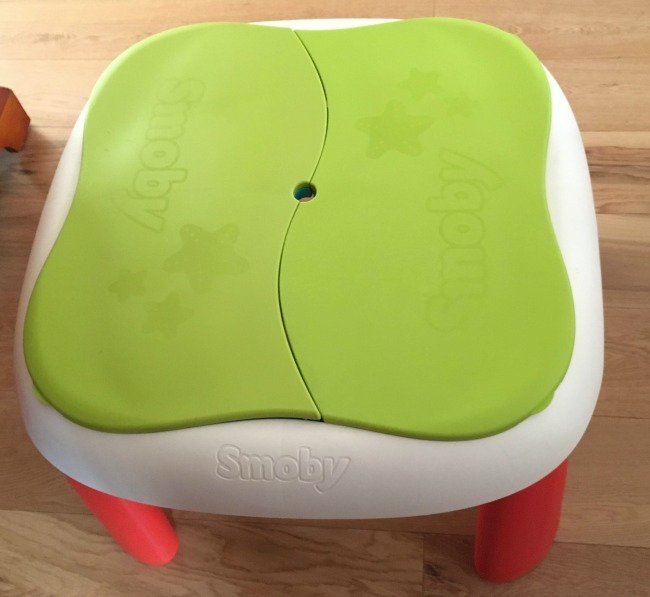 The trays are a good size and there are covers that protect the contents and turn it into a normal flat table. 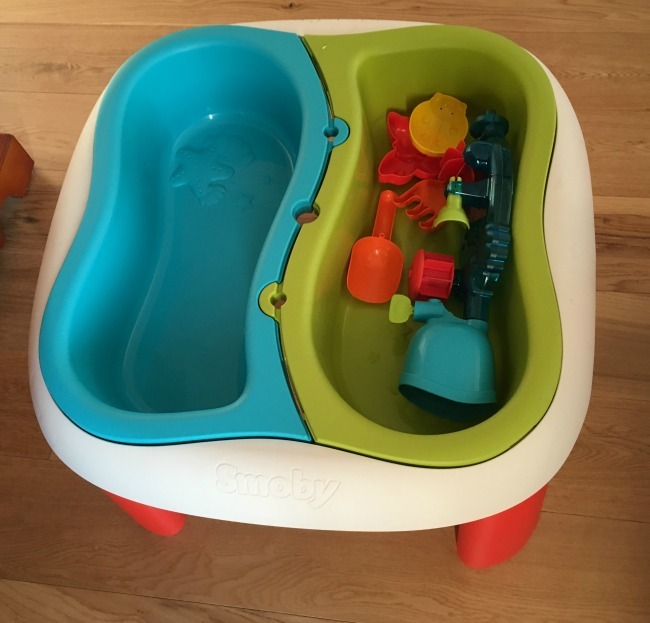 All the accessories fit neatly inside for storage. The trays lift out for easy emptying too. Covers in place make this a versatile table. We love it, I think it's expensive but I just know Bear will get hours of fun in the summer. Do you have a favourite outside toy that Bear would love? *I collected the vouchers from an on-line cash back site and paid for this table myself. All opinions are honest and my own.